At present there are three SOS Children's Villages, one SOS Youth Facility, one SOS Vocational Training Centre and one SOS Social Centre in Costa Rica. In 1972, SOS Children's Village started working in Costa Rica. Although the socioeconomic situation in Costa Rica is far better than in many other Latin American countries, poverty and neglect still affect thousands of Costa Rican children and families. In three different locations, SOS Children's Villages is supporting children and young people both in SOS families and in their families of origin. The Republic of Costa Rica is situated in Central America. It shares borders with Nicaragua in the north and Panama in the south. Costa Rica is listed among the top twenty countries with the greatest biodiversity in the world. In 1949, then-president José Figueres Ferrer abolished the country's army. In fact, he was the first president in the world to do so. Since then, Costa Rica has maintained only a small number of law enforcement guards for internal security reasons. At present, the total population of Costa Rica is 4,300,000, with roughly one quarter living in the capital city of San José. Costa Rica is home to the Inter-American Court of Human Rights and the United Nations University of Peace, both based in San José. Tourism - particularly from Europe, Canada and the United States - now accounts for a vast part of Costa Rica's Gross Domestic Product. Despite the fact that Costa Rica has one of the highest standards of living in the Americas, profound poverty still affects many people at the bottom of the socio-economic ladder. About 10 per cent of Costa Ricans still find themselves struggling to make ends meet, living on less than USD 1.25 a day. 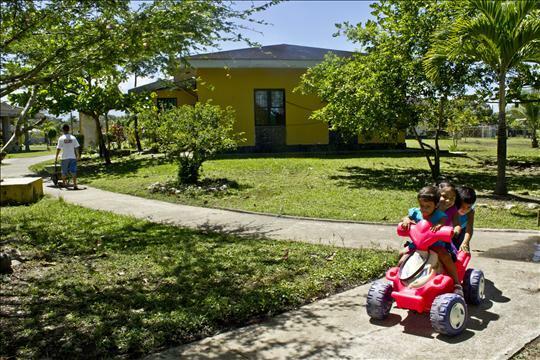 Poverty in Costa Rica is especially observable in rural areas and in certain parts of the country's capital San José. The wealthiest 20 per cent of the population still control more than half of the total national income, a figure that has been on the rise lately. Costa Rica is currently ranked 69th in the Human Development Index (HDI) that compares life expectancy, education and per-capita GNI of 177 countries worldwide. Costa Rica is, demographically speaking, a fairly young country: 26 per cent of its population is below the age of 14. The Convention on the Rights of the Child was ratified by Costa Rica in 1991. Although Costa Rica is economically far more developed than many other Latin American countries, the general living conditions of thousands of Costa Rican children remain precarious. 280,000 children of school age are not in school and roughly 9 per cent of boys aged 5-14 are economically active, mostly because their families depend on the money they generate. They mainly work in agriculture or as merchandise vendors in the streets of major cities. According to the United Nations Children Fund, 36,000 children in Costa Rica are orphans. Due to dysfunctional or non-existent family structures, many of them are at risk of ending up on one of the crime-ridden streets and barrios, where child prostitution, drug abuse and gang violence quickly become part of their everyday lives. Another severe problem in Costa Rica is HIV: although no data is available with regards to the HIV prevalence among young children, the overall HIV prevalence in Costa Rica is one of the highest in Central America. According to a study carried out by UNAIDS, knowledge of Costa Rican adolescents regarding HIV and prevention methods is limited. In 1972, a devastating earthquake in Nicaragua left the northern neighbour's capital Managua completely destroyed. It was decided that help was needed more urgently there. Thus, the start of SOS Children's Villages in Costa Rica was delayed somewhat. Tres Ríos, a town not too far from the Costa Rican capital San José was the first place where our organisation started working in the country. We aim to help children overcome difficult situations and enable them to create a better future for themselves. At present, SOS Children’s Villages is supporting Costa Rican children, young people and families in three different locations by providing day-care, education, medical services and vocational training, sports facilities and playgrounds. Children whose parents cannot take care of them will find a loving home in one of the SOS families.